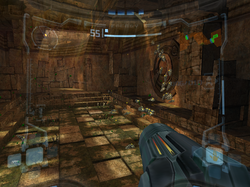 The North Atrium is a room in the Chozo Ruins. It is accessed from the Ruined Nursery and leads to the Ruined Gallery. There are two small hallways that branch of the main room that lead to the two connecting rooms. There are a swarm of Scarabs and many small, green insects. The room was once filled with water, however it seems to have been evaporated away. It may have evaporated due to the lack of an irrigation system in the room paired with an open roof, which would allow sunlight to enter the room and evaporate the water, but the water wouldn't be replaced unless it happened to rain. The room contains two Chozo sculptures honoring Tallon IV's star, FS-176, which can be scanned. It also contains two panels of data which cannot be deciphered by Samus's Translator Module, though the symbol for "Chozo" is clear. Interestingly, the room also contains three eye-shaped rocks assumed to be petrified Eyons. The Eyons may have dried up along with the water once present in the room. Records show all water in the area has evaporated. Chozo sculpture crafted in honor of Tallon's star. This petrified organic matter seems like a rock carved into the shape of an eye. Analysis indicates significant amount of water once present in this area. An atrium is a large open architectural space usually containing a glass panel as a ceiling. While North Atrium is a relatively small room, it does have an open ceiling design where a glass of some sort may once have been placed. Unlike most multiple scans, the scan with illegible symbols (of which only the word "Chozo" is recognized) can be scanned twice in the room and is treated as a new scan the second time. Both structures seem to be identical. Ironically, in the same room, the sculptures of FS-176 are different, yet contain the same scan. When one is scanned, the other will not be treated as a new scan.